The Office of Diversity and Inclusion has a unique group of individuals dedicated to ensuring that students of all backgrounds have the resources available to be successful at the university setting and beyond. Together, ODI staff works to enhance each student’s college experience by providing programs to help meet the social, cultural, and educational needs of currently enrolled minority students. Their efforts positively influence the matriculation and graduation rates of these students. Originally from Chicago, Illinois Tarnisha has served as the Director of the Office of Diversity and Inclusion since September of 2017. Prior to her position with the College of Business, she served as the Director of the Success in Engineering through Excellence and Diversity (SEED) Program since 2008. 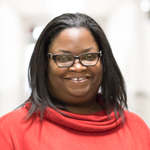 Tarnisha earned her Bachelor of Science degree in electrical engineering in 2003 from SIU and her Masters of Arts degree in teaching in 2004. She is currently wrapping up her PhD in Curriculum and Instruction and is expected to graduate in fall 2018. Tarnisha has a passion for helping students succeed and knows the impact an office like this one can have. She, herself, has benefitted from programs like the ODI and SEED and recognizes it is her duty to ‘pay it forward’ to the students of the College of Business. 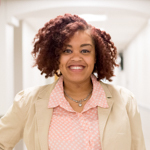 In her free time, Tarnisha enjoys listening to audio books, traveling, and spending time with her five year old daughter, whom she considers to be her best friend. 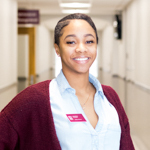 Jazlyn is a Graduate responsible for planning and executing student workshops, trainings and additional events to encourage student success throughout the semester. 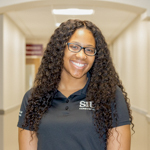 Originally from St. Louis, Missouri, Jazlyn chose SIU to pursue her Masters in Counseling and specialize in school counseling. As such, her dream job is to open her own school. 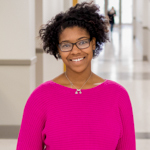 Her decision to work in this particular office on campus was motivated by the Office of Diversity and Inclusion at Hanover College, where she pursued her undergraduate studies. She wanted to help students in a similar way. For fun, Jazlyn enjoys skating, dancing, hiking and traveling. She also considers herself a foodie and loves trying foods from different cultures and local eateries. From the windy city, Donna is also a senior majoring in accounting. She hopes to one day start her own non-profit organization. Her decision to work in this office was motivated by her belief that the work done positively impacts the success of students. Her extracurricular interests involve serving as vice president of programming for the National Association of Black Accountants, serving as a mentor and regularly volunteering in the community. Ja’Viania is a senior from Lansing, Illinois majoring in sports administration with a minor in marketing. Her dream job is to be an NBA sports agent. She wanted to work in this office because she felt it is an important student-focused office and wanted to give back to others. She is the secretary of Zeta Chi chapter of Delta Sigma Theta Sorority, Inc and the Secretary of the National Pan-Hellenic Council. When Ja’Viania is not working, she enjoys volunteering, singing and dancing. Cree is from St. Louis, Missouri majoring in business management and focusing on entrepreneurship. Her dream job is to work for a television network such as VH1 or BET. She loves meeting and helping people so she felt the office was a great fit for her. She is president of the Women’s Business Association and programing chair of the RSO Naturalistas. For fun, she listens to music and hangs out with friends and family. John is a senior from Chicago, Illinois majoring in marketing. His dream job is to own his very own business. He likes working here because he is able to support students just like him. 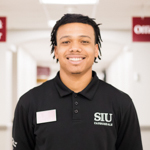 When he isn’t helping the office run events or encouraging students to take advantage of the services they offer, John likes to play basketball. Elexis is a senior from Ford Heights, Illinois majoring in accounting. One day, she hopes to work as a partner at an accounting firm. 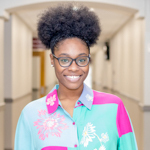 She works for this office because she used their services often during her freshman year and wanted to help other students in the same way she was helped. When she is not busy with school or work, she likes to read, relax with friends and attend meetings for the RSO’s she is a member of. These include the National Association of Black Accountants, Women’s business Association and Naturalistas.